Here you will find our background information including address, foundation & business lines. Address P.O.Box 61052, R/A 12, Street No. 12403, Jebel Ali Free Zone, Dubai, U.A.E. 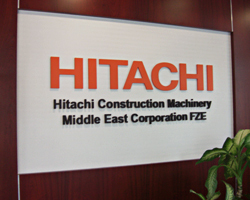 Major Operations We provide Hitachi Brand Construction machinery equipment and offer support for the mining, earthmoving, construction and quarrying industries throughout the MENA region.